I will admit, I love to vacuum.... (mopping floors on the other hand, not so much).... 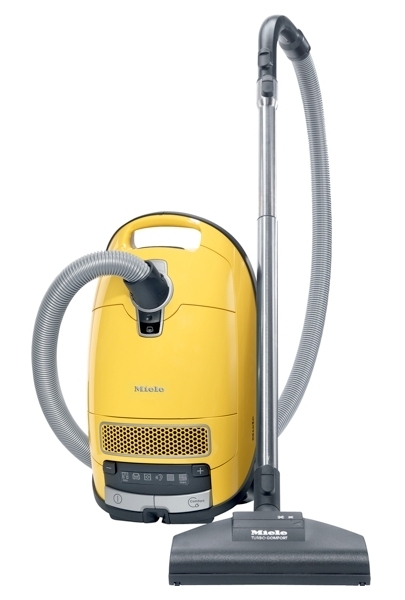 I've been loyal to our Miele vacuum since first purchased back in 2000. It has never failed us, and always up to challenge (with multiple dogs & cats in our household) of keeping our hardwood floors and seagrass rugs neat & tidy. Only recently, for like the last 3 months, the retracting cord button decided to stop working. But, no matter, the machine still worked great, and I would just loop up the cord when through. So while I was away on my picking trip 2 weeks ago, Mr. Ferguson brought our vacuum to our local shop, Buckhead-Midtown Vacuum, to see about getting the cord repaired.... Well long story short, he left with a brand new Miele vacuum and surprised me with it when I returned. But thankfully, I know Mr.Ferguson's intentions were purely honorable.... The new vacuum is really pretty (as much as vacuums can be so).... It's bright banana yellow, lighter in weight and quieter than our old one, and unbelievably powerful! The swivel head design easily maneuvers corners and the wand is "telescopic", allowing to adjust the length as needed.